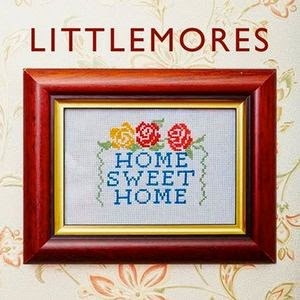 It's been almost two years since Littlemores released their Idle Idols II EP. Since then, they've consolidated into a four-piece, been building up a ferocious live reputation in Yorkshire and have finally completed their follow-up EP Home Sweet Home. Immediately the EP is unmistakeably them, from Conor Hirons' distinctive vocals, chiming guitars and lyrics that tell personal stories of the individual subject matter of the songs. The theme of home, albeit dysfunctional broken ones, flows through the whole EP. It starts with Melanie on lead track Blue Eyes Black, a victim of domestic violence who "doesn't want to make to a fuss" and "fell down the stairs, but it looked like the stairs grabbed a fistful of hairs". It's dark subject matter and told in typically honest Northern fashion. Away With A Stranger tells the story of an unfaithful male partner told with Hirons' usual panache for exposing the gritty realism of Northern working-class lives. "He was never going to wine and dine her, because his Dad were a Northern miner. He said you were one in a million, but he's working his way through the rest, he put it down to a mid-life crisis, but he thinks he's Georgie Best" Deborah is the story of a middle-aged woman who's out looking for love, but finding it hard to come by and being used by younger men that she throws herself at. Her best days are behind her "he's half your age and you know it, you're middle-aged and you show it." Again, it's the way Hirons tells us "she's mutton dressed as lamb, but she hides it with fake tan" that paints a bleak picture of the lot of the subject. The pathos in the story draws the listener in to identify and sympathise with the main protagonist. This Town tells the story of any number of Northern towns and their descent into anarchy at weekends as people go out to let go of what goes on in the week, the importance of looking right and not looking at the wrong people - "this town is mental, it's party central" and "it's not what you know, it's who you blow". Final track is short but sweet, Our William is the story of the youngest of five kids who'd moved from Surrey from Hull, having problems growing up, getting bullied and "he's in a world, a world of his own, the lights are on, but no one's home." It's the poignancy of the stories being told that mark Littlemores out from the crowd. They're accomplished as a band, but other than the likes of Danny Mahon, there's no one telling tales that get this close to the bone, talking of characters that everyone knows someone like and that you can relate to. They've shaken off the easy comparisons to fellow Yorkshiremen Arctic Monkeys that could have been levelled at them earlier in their career and found an identity of their own. It's been worth the long wait for this EP, let's hope they don't leave it quite so long for the next one. Littlemores' website can be found here. They are also on Twitter, Facebook and Soundcloud.